The Miami Blue, Cyclargus thomasi bethunbakeri (Comstock & Huntington), is a small, brightly colored butterfly endemic to Florida; additional subspecies occur in the Bahamas and Hispaniola. The butterfly inhabits tropical hardwood hammocks and their associated margins, beachside scrub and tropical pine rocklands. Once widespread and locally abundant, the Miami blue has been eliminated from much of its former range due to ever-expanding urbanization and the associated loss of coastal habitat. It is now one of Florida's most endangered insects with a single remaining extant population supporting less than 100 individuals. Figure 1. Adult Miami blue butterfly, Cyclargus thomasi bethunbakeri (Comstock & Huntington). Photograph by Jaret C. Daniels, University of Florida. The Miami blue is found only in Florida. It historically occurred on the southern mainland (from Hillsborough and Volusia to Monroe counties including several western barrier islands) south through the Florida Keys to the Dry Tortugas (Klots 1964, Kimball 1965, Lenczewski 1980, Minno and Emmel 1993, Calhoun et al. 2002). It is currently restricted to Bahia Honda State Park in the Lower Florida Keys. Adults: The adults are small with a wingspan range of 22 to 31 mm. Females are generally larger than males. The sexes are dimorphic. 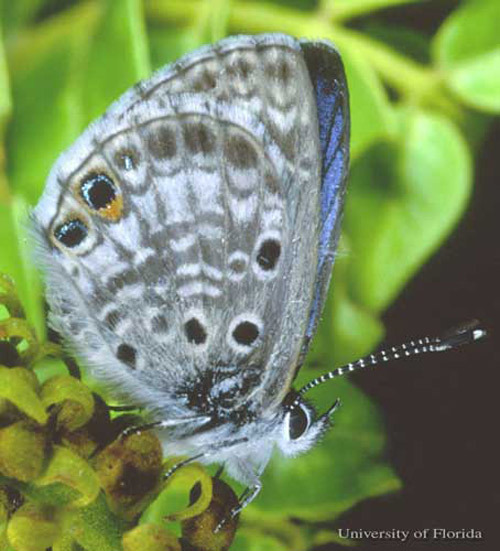 The upper surface of the wings is bright blue in males. Females have reduced blue with wide gray wing borders and an orange-capped black spot along the outer margin of the hindwing. The undersides of the wings are gray in both sexes. The hindwing has a broad white submarginal band and four black postbasal spots. Figure 2. 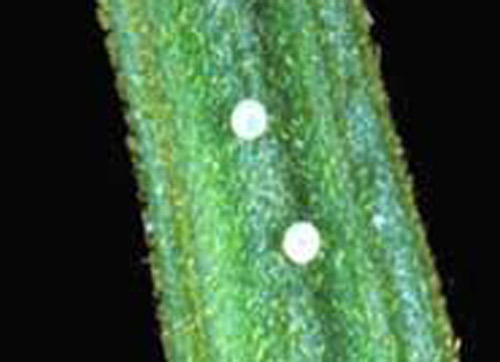 Eggs of the Miami blue butterfly, Cyclargus thomasi bethunbakeri (Comstock & Huntington), on gray nickerbean, Caesalpinia bonduc Roxb. (Caesalpiniaceae). Photograph by Jaret C. Daniels, University of Florida. Figure 3. 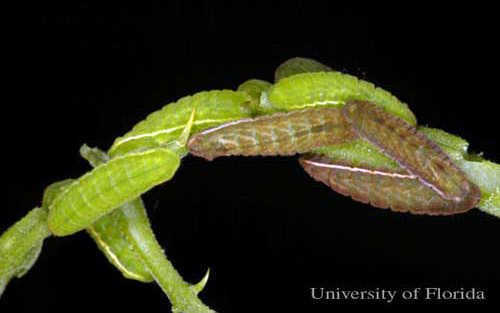 Mature larvae of the Miami blue butterfly, Cyclargus thomasi bethunbakeri (Comstock & Huntington), feeding on gray nickerbean, Caesalpinia bonduc Roxb. (Caesalpiniaceae). Photograph by Jaret C. Daniels, University of Florida. Figure 4. 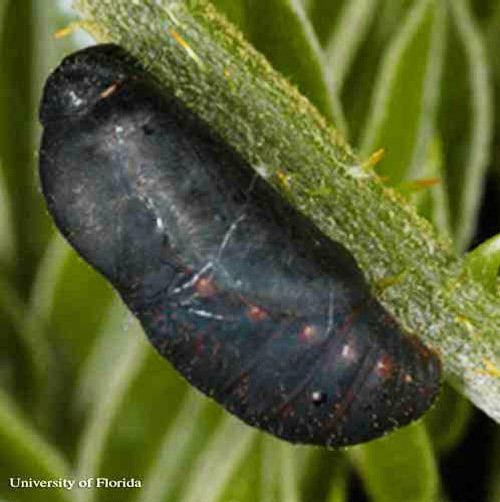 Pupa of the Miami blue butterfly, Cyclargus thomasi bethunbakeri (Comstock & Huntington). Photograph by Jaret C. Daniels, University of Florida. The Miami blue produces multiple generations (February through November) each year. Adults may found in all months of the year in the Florida Keys. Both sexes have a week flight and regularly nectar at available flowers. Females lay the small eggs singly on the terminal growth and developing flower stalks of gray nickerbean, Caesalpinia bonduc Roxb. (Caesalpiniaceae) or on the developing seed pods of balloon vine Cardiospermum spp. (Sapindaceae). 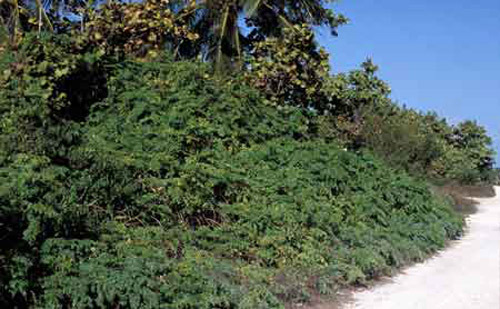 The extant Bahia Honda State Park population only utilizes gray nickerbean. The slug-like larvae are frequently tended by a variety of ants. This facultative association encompasses four ant genera and three subfamilies; Formicinae, Myrmicinae, and Dolichoderinae (Saarinen and Daniels, 2006). Figure 5. 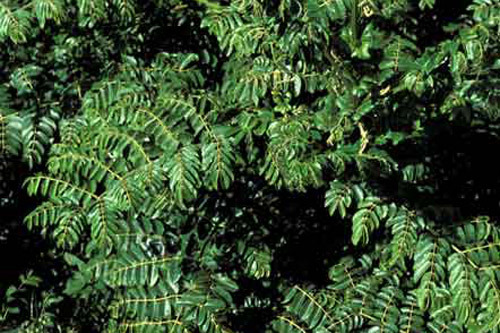 Gray nickerbean, Caesalpinia bonduc Roxb. (Caesalpiniaceae). Photograph by Jaret C. Daniels, University of Florida. Figure 6. Habitat of the Miami blue butterfly, Cyclargus thomasi bethunbakeri (Comstock & Huntington), in Bahia Honda State Park in the Lower Florida Keys. Photograph by Jaret C. Daniels, University of Florida. The Miami blue is currently listed as an endangered species by the state of Florida. Researchers at the University of Florida are currently working on a comprehensive conservation program to help recover the butterfly. Calhoun JV, Slotten JR, Salvato MH. 2002. The rise and fall of tropical blues in Florida: Cyclargus ammon and Cyclargus thomasi bethunebakeri. Holartic Lepidoptera 7: 13-20. Kimball CP. 1965. The Lepidoptera of Florida; an annotated checklist. Arthropods of Florida and Neighboring Land Areas Vol. 1. Florida Department of Agriculture and Consumer Services, Division of Plant Industry 363 p.
Klots AB. 1951. A Field Guide to the Butterflies of North America, East of the Great Plains. Houghton Mifflin, Boston. 349 p.
Lenczewski B. 1980. Butterflies of Everglades National Park. National Park Service, South Florida Research Center, Homestead, Florida. Report T-588. Minno MC, Emmel TC. 1993. Butterflies of the Florida Keys. Scientific Publishers, Gainesville. 168 p.
Saarinen EV, Daniels JC. 2006. Miami blue butterfly larvae (Lepidoptera: Lycaenidae) and ants (Hymenoptera: Formicidae): New information on the symbionts of an endangered taxon. Florida Entomologist 89: 69-74. Publication Date: September 2006. Updated: September 2012. Reviewed: January 2016.